What could Ready at Dawn have done better in The Order: 1886. ...especially the whole notion that their all hundreds of years old. Spellcheck is a poor editor. But, fair enough on the observations. Damn. I was looking forward to this. I'll probably pick it up when it's about a tenner. Man there are werewolves AND vampires in the game? Urgh it is too bad that you hardly see them, I would buy this game otherwise despite the flaws. I KNEW wikipedia would be the first website to become self-aware! As a closing thought, at what price point would The Order: 1886 have been a reasonable purchase for you? Given that it's a redundant stock standard third person shooter that leans far too heavily on being cinematic while squandering it's interesting concepts? Ehh... I doubt I'd find it worth playing at any price. There are too many other actually good and interesting games to play out there already. $20 is a pretty fair price for a six-hour single-player game with great art. I've happily paid that much for Journey, Transistor, Bastion, Flower, Braid, or The Walking Dead. Yup. Just another bland, soulless AAA FPS by the looks of it. Shame, too, because I at think enjoy the character designs and weapons, even if I do hate Steam Punk. D'oh well. Back to the grind then, eh? Nothing to do or see here. How much would I pay for this? Eh, ten bucks, maybe. Here's the problem, I don't know how much the game would be worth to me because I only know it isn't worth what they're charging for it now. It's sad, because I think we all wanted to like this game. But seriously, there were some stunning games at the end of the ps3 generation (Uncharted series, The Last of Us). I don't think we need to push that further into the graphical beast to the detriment of everything else. I just want everything to be slightly better than those games. They don't have to be juggernauts of graphical content. Just incrementally better with a story holding them up. There will be a day where our machines handle these kinds of graphics like they're word processing. In those days graphics will only matter if they're bad and the story and mechanics will be the main focus. Thats one way for each hour the game lasts! The last boss fight is a QTE. 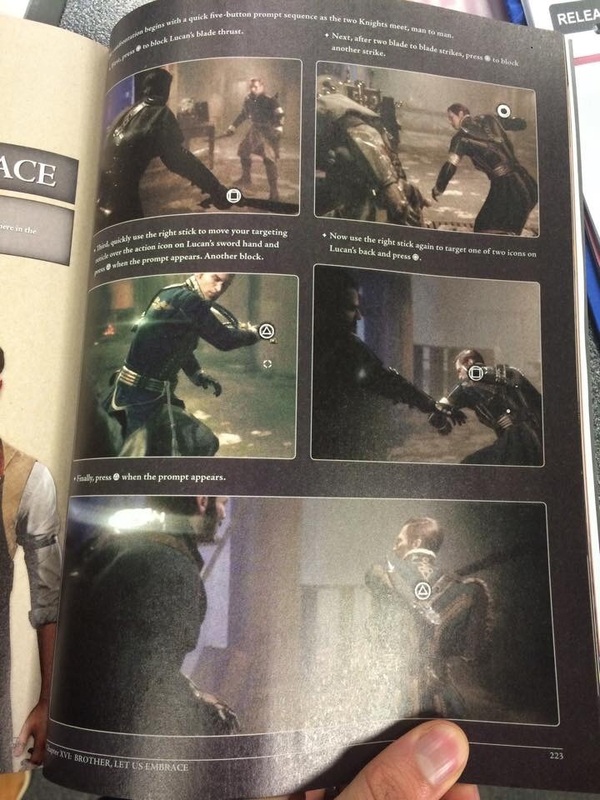 And the strategy guide has tips for it! 1) Length. Quality or not, I'm not paying full price for Metal Gear Solid: Ground Zeroes, know what I mean? 2)Gameplay mechanics. If it's the same stuff we've seen ten million times before (i.e. generic cover-based shooting with essentially nothing to differentiate it from other third-person shooters), then you've lost me. I'll play a game with interesting and unique mechanics, even if it's ugly and unpolished, over something safe and boring like Battlefield. 3)No obvious greedy moves. You're telling me, after six hours of "quality" gameplay, the game just ends? Only leaving you with blatant sequel baiting? Yeah, "quality" indeed, Ready At Dawn. If your game was such high quality, you would have wrapped up some of the many plot-threads twiddling about in the wind. That ending sounds just very disappointing. I'd pick it up at $40, but I don't even have a PS4 yet and, from the sounds of one of the games I was kinda hyped for, I might put it off a bit longer. To answer the question: about $5. I've already saw this 'movie' on youtube and it wasn't very good; certainly it was my impression that the ending with Batman-like view of the city was just a big sequel bait. $5 is what most of modern shooters are worth for me. The game wasn't terribly innovative, I was able to call out the story darn near the beginning. The gameplay left a lot to be desired, and the ending was a joke. So, as the first entry in a possible trilogy, this title would be worth about $25, with each subsequent title being worth about the same. That puts the eventual boxed set of the trilogy as a near $80 experience, which I'd be fine paying if the story was good. However, I'd STILL want a solid 25+hours out of it, and I KNOW I wouldn't get it. Hell, most devs would laugh at me for what I just said, but they have to realize that there are TONS of other products vying for my attention, and at the end of the day, I just don't NEED any game unless it proves itself to me. Also, I care not a whit for multiplayer. I grew up on RPG's (Western and Japanese), so that sort of shaped my gaming proclivities. To me, Persona Q, Fire Emblem, Dragon Age, or Banner Saga would each be worth top dollar, but not a myriad of me-too action shooters. I present to you the fines and most original piece of snark you will ever witness on the internet. More seriously though, they really should have made it a game, instead of a movie where you play out some of the action scenes. Actually, it wouldn't be half bad if they made it into an actual movie, from what I hear, a lot of people would be fine with dropping a few bucks to watch it. This was basically the Ryse: Son of Rome for the PS4. Interestingly enough the PSN pre-order price was already around AU$20 lower than the average triple-A title ($79 as opposed to $99). I was tempted but cautious about the rumoured cutscene/gameplay ratio. In the end that doesn't bother me as much as the letterboxing during gameplay, which would frustrate me to no end. I don't know what price would be reasonable, but I'm looking to wait until it's less than AU$30 (maybe more if I'm desperate for a new game). I don't have a PS4, but having read the ending it's very disappointing. I hate these open endings that makes the players journey mean nothing just to tease the sequel. You can have an ending that's open for sequel but not making the player feel like they just played a prologue. I would pay $10 for this game since it's essentially a prologue. Sounds like a $2 Redbox rental to me. Its not so much the length of the game as the replay value. Dishonoured for example. I'd say it took 12ish plus hours to beat it the first time but the fact that there was various ways to complete the game was a bonus. It kept it fun for a while and is still something I'm likely to come back to in the future. The Order does not. It sounds like it has one way of doing things and thats it. Where is the fun in that? You might as well just make it a movie. It might be fun for a weekend playing with some friends but not at its current price. Not even a buy. Rental for sure.